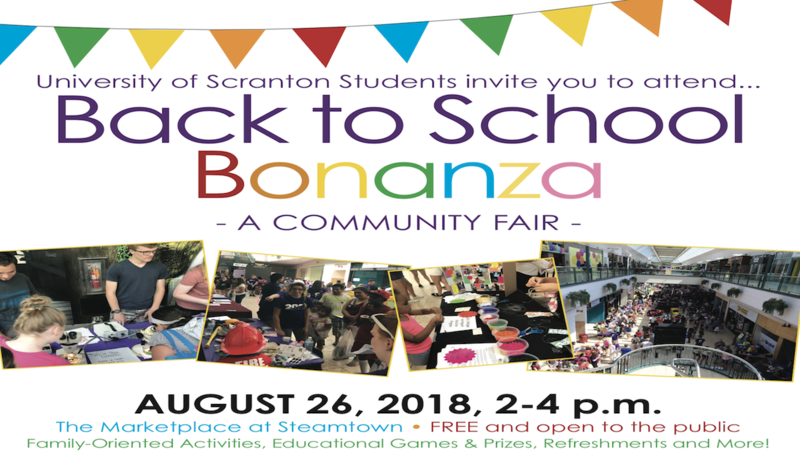 The University of Scranton and the Class of 2022 will host the 7th annual Back to School Bonanza for children aged 3-12 years and their families on Sunday, Aug. 26 from 2 p.m. - 4 p.m. The event is held on the first floor of the Marketplace at Steamtown. This event is free and open to the public, no registration is required. The Bonanza features educational activities, games, face-painting, crafts, giveaways, and healthy back-to-school refreshments and snacks. More than 25 family-oriented activities will be at the Bonanza organized by community partners and University faculty, staff and students. Some of the hands-on table activities include Neuroscience for Kids, Microscopic Exploration and giant checkers and jenga games. The Back to School Bonanza is one of the University’s Fall Weekend Welcome activities for the Class of 2022. It is hosted by the University’s Center for Student Engagement, Office of Campus Ministries’ Center for Service and Social Justice, the Jesuit Center and the Office of Community Relations in partnership with The Marketplace at Steamtown, Lackawanna County, Scranton School District, and other community organizations.